VSS/VSR size 1, 2 & 3 are plug-in, base mounted interface valves conforming to ISO standards. The valve design offers maximum flexibility and is available in either a high flow rubber seal (model VSR), or matched ground spool and sleeve (model VSS). The lateral plug-in style manifold makes it easy to increase or decrease the manifold stations without wiring work. 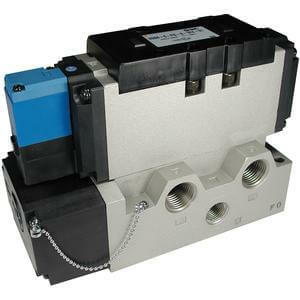 In addition, SMC now offers a light weight, large capacity mini ISO valve (size 01).